This is the first in a series of posts called “The 12 Artist Myths” that explores the most common widely held beliefs people have about artists and creative individuals of all types. It also represents beliefs that we artists have about ourselves that hold us back from reaching our fullest potential. There seems to be a general cultural consensus that artists are unable to generate an adequate income with their art. What do I mean by “adequate?” For the sake of simplicity, let’s say that an “adequate income” would be the funds needed to support an average family’s lifestyle. Many believe this is true, and even fewer believe an artist can actually have financial abundance above and beyond the average family’s income. Those who are examples of success are often dismissed as being “lucky”, or “in the right place at the right time.” In this denial-fueled mode of thought, artists often receive their success from a noble, wealthy patron who rides in like a Medici on a white stallion dispensing favor and social connections. And also according to this philosophy, there are many more talented artists who sit in the ashes of anonymity just waiting to be “discovered”. The origins of this question of a creative person’s ability to sustain himself with his or her art are deeply rooted within western culture. 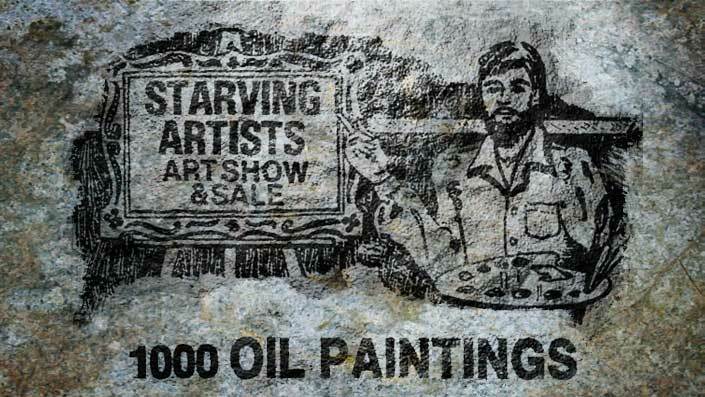 One only has to look toward the often used phrase “starving artist” for ubiquitous proof. Why don’t we hear “starving janitor?” Or “starving security guard”? Or even “starving lunch lady?” Those professions, while perfectly honorable, don’t exactly bring gold flowing into the bank account. I believe there are a number of reasons why there is a widely held view that being an artist doesn’t exactly pay the bills. These reasons fall into two main categories, external and internal. Of course, the internal ones may be difficult to hear… because they are due to erroneous beliefs and thinking within the artist. 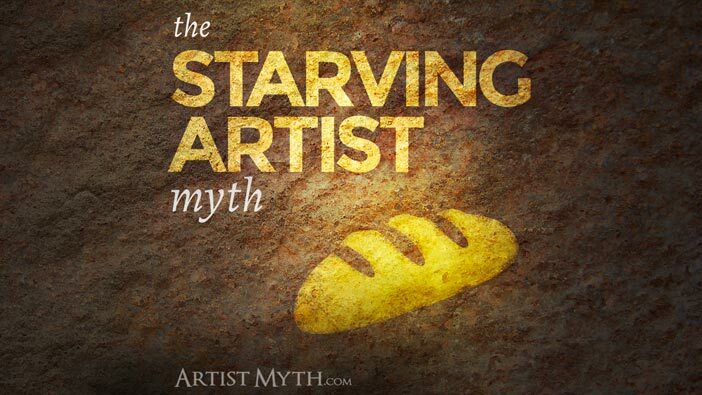 With those positioning statements made, let’s continue to some specific reasons, divided into internal and external beliefs… these beliefs, or “sub-myths” all contribute to this bigger “starving artist” myth in some fashion. Oral and written traditions born out of historic events. Romanticized views that are no longer accurate. Cultural stereotypes that impose limitations. The perception that artists don’t have a “real” job. The thought that art has an arbitrary value, or no monetary value at all. The assumption that art should be a gift. “There’s not an audience that will love my work enough to pay for it. “I don’t really know how to talk about my art”. Have you as an artist felt any of these myths to be true? Or have you experienced these beliefs from other people? Have you considered that it’s impossible to make good money doing what you love, that you should just keep your art as a hobby? Or have you felt as a young person that your parents were driving you away from being an artist, towards a more “stable” position or profession? If you have, then you’re not alone. Every day, creatively blessed individuals just like you think the same things you do. They work through the same struggles, have the same feelings, and deal with the same barriers. Well, since so many of us think that way, it must be true, right? The truth is, these erroneous beliefs are like a perfect storm of illusion. They all conspire in various ways to keep you from being fairly compensated for the wonderful things that you bring to the world… beauty, meaning, and a higher consciousness. Now that we’ve dealt with some of the reasons why people believe artists can’t make a living, support a family, or whatever – let’s talk about why its totally, absolutely, unequivocally not true. There are a bunch of artists just like you who are making a living at it. Sure, they may not be buying five hundred bottles of champagne every night, but they pay many, if not all, of their bills with their art. They have much the same background as you do, similar talents, and similar experience. What makes you so different from them? They just produce and ship. They don’t sit for hours and ponder or become paralyzed by “what ifs” and endless re-starts. They aren’t plagued by self-doubt at every turn that keeps them from actually creating anything. They aren’t afraid to network with the right kind of people. Artists have unique and valuable talents that are worth supporting. You have a special gift to of humanity that has lasting cultural value. Artists are historians, architects, craftspeople, builders of beautiful things. Centuries after a society fades away, the work of artists remain, like the drawings in the caves of Lascaux, France. In a more immediately practical sense, your art can be decorative, therapeutic, and inspirational. Every day people buy art that gives them back priceless gifts that are worth much more than the purchase cost. Artists can learn financial basics. Anyone can easily learn the financial principles necessary to be at least moderately successsful. If you can do third grade math, then you can perform the basic numeric tasks required to ensure that you make more than you spend each month. You can also learn how to properly price your work and send invoices. (That one’s really easy… if you can type and send an email, then you can send an invoice to a client. The biggest problem with sending invoices is the mental block of actually sending it. The person best qualified to sell artwork is the one who made it. You can learn how to build a following that loves your work, how to talk to them, and how to relate your story. There’s no snake oil on canvas or sleazy car salesman-speak involved; the easy relationship between artist and buyer can then naturally evolve into a mutually beneficial transaction. Artists can fairly price their work. A fair price is the one that both the artist and buyer are happy with. The biggest problem of most artists is that they price their work too low. How do you tell if you’re pricing it too low? After selling a painting, do you look at the wad of bills in your hand with a tinge of regret or a touch of resentment? Then you priced your work too low. Or did the transaction leave you with just enough to cover the cost of materials? Then you priced your work too low. Unless you want to keep art as a hobby, or turn it into a charity, then you need to price your work higher. There is a way to confidently and systematically price your work so that you both walk away satisfied. The buyer gets a great piece, and you get to not just eat another day, but to keep doing what you love. Look around. You are surrounded by the work of artists. These artists were supported in some way by the work they did, and you can be too. All you have to do is learn a few basic principles and systematically put them into practice, and you’re on your way to living a life free to do the work you were meant to do. Or maybe you already are… do you work as an artist full-time? Are you earning a decent living? Maybe you have a thriving, successful creative career that not only sustains you financially, but gives you the freedom to make your own schedule and create your own personal brand that people want to buy. If this describes you, or if you have any questions, thoughts, or comments, please let us know. I leave you now to create the story you want to be in. Love this explosion of the myth of the starving artist. Nicely stated! There are a bunch of artists just like you who are making a living at it. Sure, they may not be buying five hundred bottles of champagne every night, but they pay many, of not all, of their bills with their art. They have much the same background as you do, similar talents, and similar experience. Feel free to not post my comment or edit out my call-out to the typo! Thanks for the kind words, Donna. Also, for the spelling fix – I fixed it. Wow…I’m SO GLAD I found this site!!! 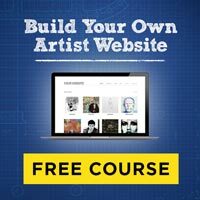 I signed up for your Udemy course and can’t wait to get started, but in the meantime thought I would check out your site. You touch on the exact issues I have been dealing with for the last 20+ years. Growing up all the way through high school and into my early adult life, I was fueled by creating art. I loved it, and was really happy with my progress. Then the “reality” mindset started taking over and sadly, I left it behind. I am now in my early 40’s and starting to come to a point in my life that I realize I cannot go on being untrue to myself any longer. Art is a part of who I am, and I need to face those demons and fight through those mental barriers I created for myself if I have any hope of being truly happy again. THANK YOU for creating this site…this couldn’t have come at a better time for someone like me (and I’m assuming there are plenty more out there). Thank you, Chad! I’m so glad you found the site helpful and thanks for signing up for the course. I”m proud of you for discovering your true self, even all these years later. It’s easy to regret what we’ve done (or things we haven’t done)… choices we’ve made… but I like to think of that as just part of who we are now. No regrets! Just experiences. It’s just like when people buy your art, they are buying not just a few hours of work… but they are buying 20, 30, 40 or more years of YOU. It all goes in there, and it comes out in our creative product. Best wishes for your newfound creative passion.